The living Room of Butterfly Villa is very spacious and comfortable, with open-rafter ceilings adding to that tropical ambience. The room opens out through double french doors to the upstairs verandah, with steps from there leading down to the entrance and the swimming pool area. 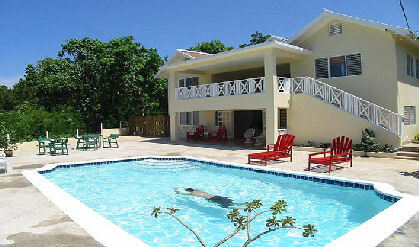 The swimming pool at Butterfly Villa is very sunny and is located just off the Entertainment Room. Surrounded by lush vegetation, there's ample privacy on the expansive pool deck. The King Bedroom, Bedroom One, of Butterfly Villa is spacious with two sets of louvre (insect screened) and picture windows on the East and North sides. The room is air-conditioned and there is also a ceiling fan. There also an overhead mosquito net. The bathroom, en suite, has a tub and shower, and double face basins with large mirror. All bathrooms have showers, master bathroom also has a bathtub. Cook & Housekeeper work flexible hours and will serve dinner at your convenience.